With work on the Wheel of Time maps proceeding slowly (there’s a lot of them), I thought it’d be fun to throw together another map more quickly. This is a map of Joe Abercrombie’s Circle of the World, the setting for his First Law Trilogy and several additional novels and short stories. This is one I’ve wanted to do for a while, as the existing maps are great pieces of artwork but are not the clearest in the world. A map of the Circle of the World. Click for a larger version. Joe Abercrombie’s First Law world is divided into three continents and numerous large islands. The North is a land of frozen rivers, towering mountains and ferocious creatures called Shanka. The Northmen are hardy warriors, living in a land of war, raiding and a rough kind of honour. The western continent is land of prairies and plains, reminiscent of the American West. This continent is the location of the Far Country, where rumours of riches and gold have drawn settlers, and the Old Empire, a formerly great nation that has collapsed into civil war. The southern continent, Kanta, is a vast land of deserts and arid plains with civilisation clustered around the great rivers. Kanta is the home of the massive Gurkish Empire, the largest and most populous nation in the Circle of the World. Located between these continents are several islands, the most notable of which are Midderland, Styria, Suljuk and Thond. 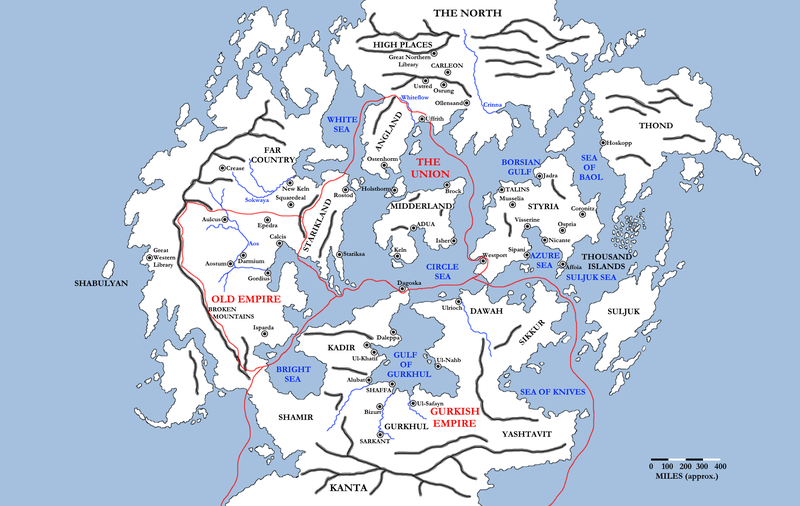 Midderland is the homeland of the Union, a large empire which includes possessions on all three continental landmasses: Angland in the North, Dagoska in Kanta and Starikland on the western continent. Adua, the capital of the Union, is located in Midderland. Styria is a collection of feuding city-states, the most powerful of which is Talins.